The Travel Photographer of the Year exhibition, featuring the best of the work entered by photographers from 114 countries in the annual competition, opens in London this week. 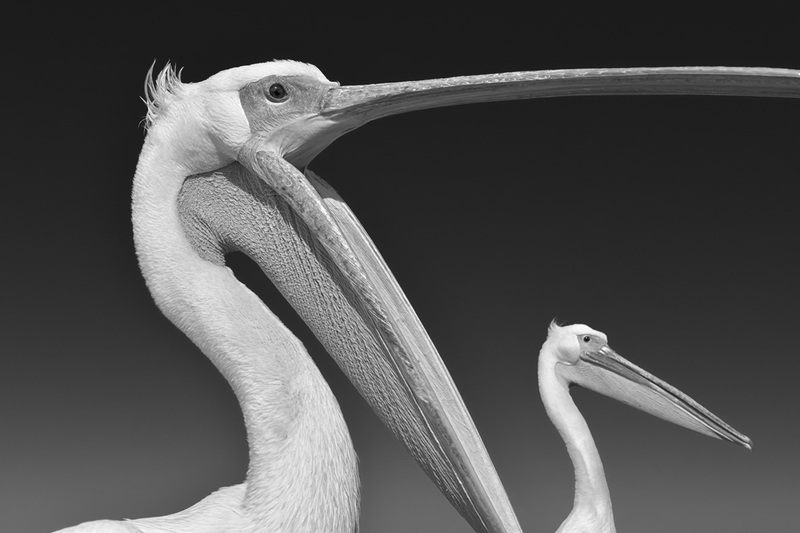 Marsel van Oosten, a 49-year-old Dutchman, was the overall winner with a black-and-white portfolio combining landscapes from the cypress swamps of Louisiana with portraits of pelicans off the coast of Namibia. 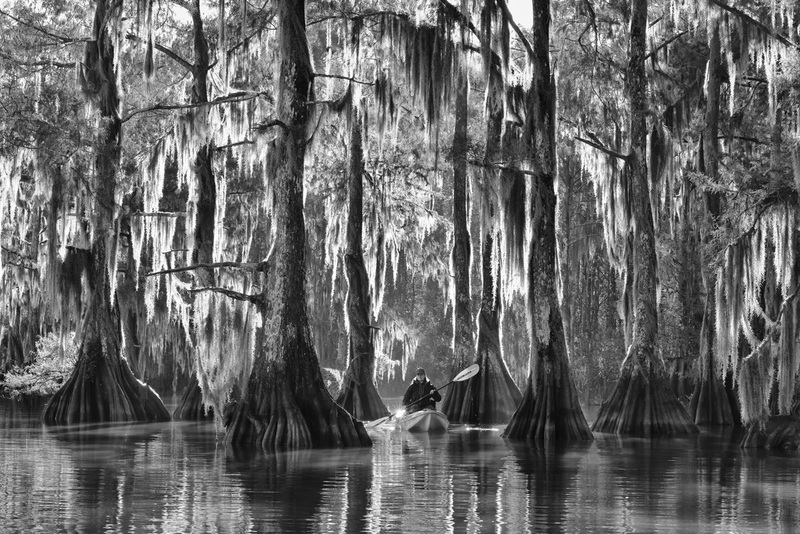 Van Oosten, a former art director in advertising, now combines photography with leading photo-tours (including one to the swamps of Louisiana and Texas). Here he talks to Deskbound Traveller about photographing tigers, his early efforts with a camera, and the difficulties of being a nature photographer in the age of GPS and social media. Yes, the idea of tigers in Africa is a a bit strange, but it’s a so-called ex-situ conservation project, where they are trying to save the tiger outside its natural habitat of India and South-east Asia. We did very well because there are plenty of tigers. It’s perfectly suited to tigers but slightly different from their habitat in India. The bush is less dense, for instance, so it’s easier to find them. So for photography it’s perfect. It started because a couple of years ago I was asked by National Geographic Traveller to photograph for an article on tiger safaris in India. I spent a week in India doing just that and found only one tiger, on the very last day. So it was frustrating. Then I heard about this project in South Africa [run by John Varty, a film-maker and big-cat enthusiast], and I thought, “Let’s try that.” And it worked very well. I strongly believe in the project, and that’s why we set up the tours there. I’m working on a book about it at the moment. Who’s going to be publishing the book? It’s going to be self-published. It’s going to be basically a photo-book that I’m making with the owner of the project. I was interested partly because it’s a controversial project — I never shy away from controversy, so I thought I’ll have to see this with my own eyes before being judgemental. At the moment it’s one of the most successful tiger-conservation projects in the world. It’s the only project where tigers are actually thriving, and it’s growing and expanding. It started in 2001, I think, with four imported tigers. I’m not entirely sure when the first wild tigers were born there, but they’re all the result of those four tigers. Later on another gene line was introduced, so there are now three different gene lines there. Probably the only challenge that the project has is to make sure that the gene lines stay healthy. So they do have to give birth control to tigers that produce more than a certain number of litters. How would you respond to people who say that there’s something unnatural, artificial about a tiger safari in Africa? What a lot of people forget is that at some time in history lions, leopards, cheetahs and tigers all roamed the same continent. So it’s not so strange. If you look at all the species on the planet you will find that a very large number are actually introduced species. We’re just not aware of that because they’re not charismatic mega-fauna like the tiger. The other thing is that if you look at tiger numbers you’ll see that the tiger is doing worse and worse. Numbers are dropping and have been for many years. Every now and then there is a little spike, so they seem to be doing better, and then it’s getting worse again. I don’t think the Indian government’s response is ever going to work. Population pressure, which is already the main cause of the problems there, is only going to increase. All the tiger parks are surrounded by villages, they’re not fenced, meaning that the tigers will wander into villages, causing a lot of problems, and they’ll be killed. And at the same time people can wander into the parks without much trouble, and this is obviously what happens very often, because of the increasing demand for tiger parts from other countries. With a population that’s so poor living next to a tiger park that’s unfenced, yes, it’s just asking for trouble. When John Varty was asked for help he told the Indian government: you need to fence your parks — to keep the tigers in, and to keep the people out. They never did that. In contrast, if you look at game parks and national parks in South Africa, the vast majority are fenced; even Kruger National Park at one stage was completely fenced. A couple of years ago they decided to remove the fence on the Mozambique side, and that was the start of the rhino and elephant poaching. So a lot of the critique is from people who don’t know a lot about the situation in South Africa and India. When they read more about it or visit themselves, or look at the actual data on tiger numbers and what’s happening, then they understand that you have basically two options: either you just sit back and hope for the Indian government finally to address this problem, or you try something like this [Varty’s project]. It’s an experiment, but for me, personally, I would much rather see something like this, and have the tiger survive in Africa, than sit back and wait for the tiger to be wiped out in Asia. By that I mean wild tigers, because I think there are more tigers living in the US in captivity than there are in the wild at the moment. I see from your website you started taking photographs “to escape from life in the fast lane”. When was that? And why photography? It’s sort of a natural thing. When you are an art director — and I was an art director in advertising — photography is a very important part of your work. Your ad is only as good as the visuals that you use, so it was very important to find the right photographer. When I found one, I worked very closely with him or her to create the look I wanted. And that’s when I started to learn and appreciate photography much more. I went to art school before I started in advertising. I was there for four years, and I had the option to choose photography as one of my majors, and at that time I didn’t like it at all. It was very much concentrated on black-and-white photography and spending countless hours messing around with chemicals in a darkroom. It wasn’t something that appealed to me at all. So I decided to major in graphic design and art direction. Then I got my first internship in advertising; that turned into a job… So it was really only when I was in advertising that I got into photography. So you hadn’t done much with cameras before then? No, I was like everyone else: I had a small point-and-shoot camera that I brought with me on holidays and I snapped whatever I saw. I wasn’t very serious about it. It was in advertising that I learnt about what works in a photograph and what doesn’t. When I looked at my own images, I saw that my work was really bad. I started to read more about photography, to practise a little bit more, at weekends, and over time it got more and more serious and I got eager to get better results. Then in 2001 my wife and I went on honeymoon to Tanzania: my first African safari. Until then I’d never really been into nature photography, and I’d never really been serious about wildlife photography. After that trip, I was hooked. It became clear to me that I was very much into nature photography — whether that be landscapes or animals, it wasn’t very important — anything natural. 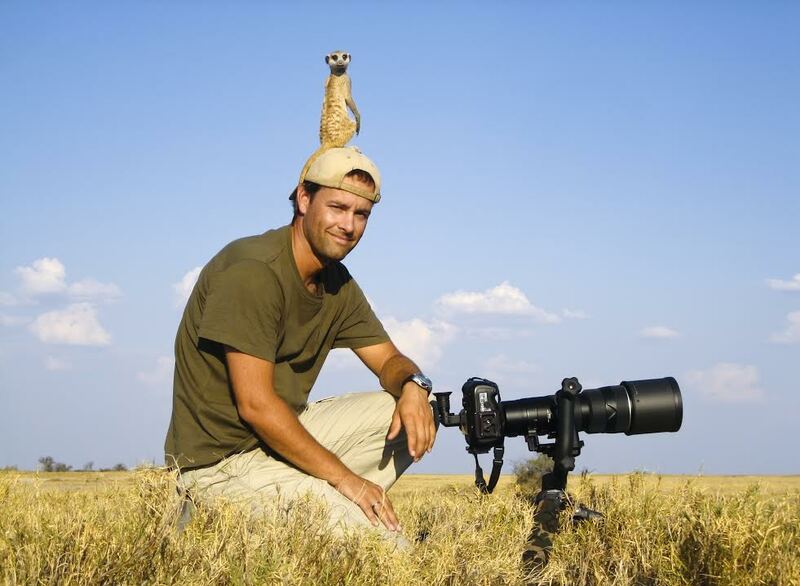 What in particular was it about the Serengeti and Tanzania that made you decide to specialise in nature photography? I think it’s a combination of a lot of things. One, obviously, is being outdoors, as opposed to photographing in a studio or something. Also, especially with wildlife, the fact that you never know what you’re going to get. It’s a bit like going to the casino — though I don’t like casinos at all. Every day you get in your jeep and you drive out, and you don’t know what’s going to happen. One day it may be quiet and the next day you might suddenly get something truly spectacular in front of your lens. It’s the anticipation: I really like that. And in a sense in many ways it was also a reaction to my work in advertising. I was responsible for coming up with all kinds of ideas for ads and commercials. The moment I made a schedule and came up with a concept and the client approved it, then I was able to make it — with a photographer, or an illustrator or a director. Anything was possible. The sky was the limit. In almost everything I did, there was so much manipulation to get to the final product. And in a way there was very little challenge in that, because if everything is possible, there are very few challenges. The thing I very much like about wildlife and landscape photography is that you’re not in control. This is particularly the case with wildlife photography: you’re not in control of the light, you’re not in control of the weather conditions, you’re not in control of your main subject; and it’s just a lot of hard work, patience, trying to understand the behaviour of the animal, trying to be at the right spot at the right time, and then just hope for the best. I really enjoy that — working with a lot of variables that are hard to control. Every now and then it all comes together and it works. Pretty often in your case. It seems to come together extremely well. Ah, yes, but there are also a lot of times when it doesn’t. Those situations, the vast majority, when it gets close, but then doesn’t quite work. In one of your blogs, you write of how important it is for you to excel in the two disciplines of wildlife and landscape. Why is that? They are different genres and each requires a different skill set. It’s a nice challenge to be able to do both. I’m convinced that doing wildlife photography makes me a better landscape photographer and doing landscape photography makes me a better wildlife photographer. It’s really hard to do both well. There are very few photographers who do. Most landscape photographers are poor wildlife photographers and most wildlife photographers really struggle with landscapes. They’re really different. You’re outdoors for both, but each requires a different mindset, different techniques. I just like the challenge of doing both. 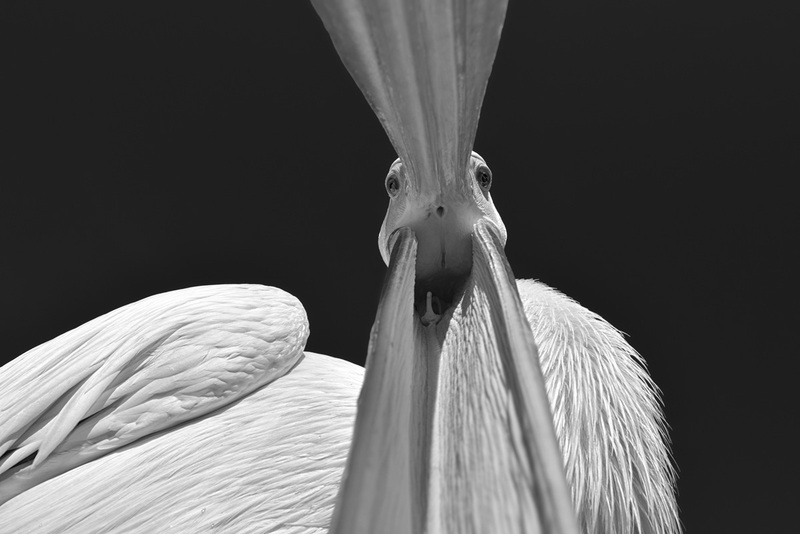 If I were to do just one, say wildlife photography, then after a while I’d be on semi-autopilot. I use a certain technique, certain approach, certain strategies that have proved successful, and then I forget to really challenge myself and think about creative alternatives. I find moving between the two is really refreshing. It keeps me sharp. I think to develop my creativity it’s important that every now and then I try to to do something that I’m not 100 per cent comfortable with. That will force me to rethink what I’m doing and maybe come up with different solutions. As in trying to take photographs while sitting in a kayak? 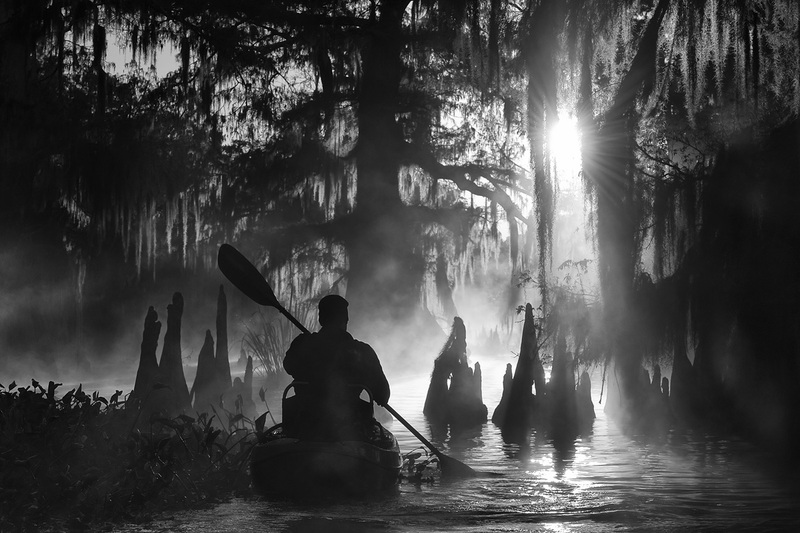 I gather from your blog that you hadn’t paddled a kayak until you went to Louisiana. That’s a very good point. Graphic design is very important in my photography. My art education and my advertising experience is really obvious, I think. I’ve always shied away from rain-forests, forests in general, because there’s so much clutter. If you look at my work you’ll see more deserts and snowscapes — very strong graphic lines and no clutter at all. I found it extremely hard at the beginning. I paddled for a couple of days without taking any photographs at all because I just didn’t know where to start. I was trying so hard to do what I was used to doing in landscape photography, and I found that it was just impossible to take any photographs. It took me some time to get used to the landscape and gradually try things out and come up with solutions that were new and that I would still feel comfortable with. Exactly. Powerful shapes, graphic lines, a surreal landscape; different from anywhere else on the planet. When did you start doing photography tours, taking other people with you? A previous winner of the Travel Photographer of the Year competition told me that most of his earnings come not from photography but from leading tours to places where he has photographed. Is it similar for you? Is that simply something photographers have to do these days? Yes, I realised 10 years ago that it wasn’t going to end well for me if I tried to earn money just by taking photographs of nature. Already at that time there was digital photography, there was the introduction of micro-stock, with websites selling images for as little as $1. I’ve always been extremely aware that my subject matter doesn’t change. I shoot landscapes and wildlife and those are always sort of the same. These days, nearly everything you buy has a camera in it, so there are loads of people taking photographs. The supply has increased incredibly, but the demand for my kind of photography has decreased and is still decreasing. It’s very different for photographers who photograph people, for instance, because their subject matter constantly changes. You can tell the difference in photographs featuring people taken now and five years ago. When I take a photograph of an elephant now, and compare it to a very good image of an elephant taken 20 years ago, well, you can still use that photograph taken 20 years ago. All the advertisers are moving away from print media towards the internet. Print media are struggling; budgets are far smaller than they used to be. It’s impossible to make any money in what I do by just selling images directly to publishers. Most people booking a trip want to know exactly where they are going. On your Louisiana and Texas tour you make a point of not telling people exactly where you go — and then asking them to sign a promise to keep the locations secret once they have seen them. Why’s that? Yes, it’s very unusual to do something like this. It’s a response to what we’ve seen over the past couple of years. People taking photographs on the trips have been posting them on Facebook, Instagram and other websites. Other people see an image that has been posted and is very popular and they also want to go there. That’s to be expected. Before social media, though, the effect wasn’t as great. Now, within a year, a very exotic location that no one has seen before can be turned into an overcrowded destination. I’ve seen it myself, in Namibia. We were the first company to organise photographic tours there; there was no else, we had every location to ourselves. Now it’s getting very, very busy. It’s the same in Iceland in winter. Less than five years ago I was there in winter and there was no one else, because everyone went in summer. Now it’s just insane: the entire island is even more busy in winter than in summer. I’m convinced this is because of the internet and especially social media. People see these images and think, “That looks cool; I want to go there next year.” Look at the Lofoten Islands in Norway: three years ago no one had ever seen up there. Now, if you look at photography websites such as 500px.com, it’s insane the amount of photographs you see. Social media have turned that particular location from something no one had ever seen before into an area where there are 50 photographers standing at the same spot trying to get those photographs. So I’ve become very cautious nowadays with where I’m going. A lot of times when I’m travelling somewhere, I’m not sharing that information on my social media or on my website. This is when you’re travelling on your own? Yes. When I’m doing a trip on my own often it’s a scouting trip for tours we’re planning. We’ve had many instances where other tour companies were copying our tours, even going to the same spot on the same date. It’s horrible when something like that happens. So when we decided to go to Louisiana and Texas for the swamps, we decided we weren’t going to share that with people. We tried to keep it a secret for as long as possible. Then, after we had paddled there, we decided this was such a pristine area, so quiet, so wild that it was important we try to keep it like that for as long as possible. That’s why we decided to ask all our participants to sign this document promising not to share the exact locations. One of the nice things about this place is that it’s such a labyrinth of water and trees and it’s extremely hard to find the best places. But once someone has found a few very good spots it’s extremely easy to share that information and then, in no time, it will be very easy to copy those images. So that’s the main reason we did that: to try to keep it quiet for as long as we can. The response of people who booked that trip was very, very positive. They were all excited to sign the document and to keep it a secret. In the end it’s also in their best interests that only a handful of people have photographed there. That means that their images will be unique or original for a longer time. On our trips we see a lot of photographers who photograph with GPS systems on the camera, so that every image is automatically geotagged. When they put it on the internet, that information might still be in there, and then it will be extremely easy for people to go to the exact same spot, set up their camera, and get something very similar. And the most difficult part of landscape photography is knowing where to put your camera, where to set it up exactly. Once someone has already done that, successfully, and you know exactly where that photographer was, then, in theory, you can recreate the shot. Yes, without having to go through all the work that photographer did, scouting out the location, driving back to the same spot early in the morning, late in the evening, waiting for the light to be just right. Yes. A lot of photographers on the internet are what I call icon-hunters. They look at the images that are extremely popular, and then they travel to those places and try to make exact copies. By doing so they create a portfolio that consists only of those iconic shots. But part of the fun, I think, of doing what I do is to try to create things that are completely different from what’s already out there. That’s really important to me. Before I go on a trip I look at what has already been done by my peers, and then I try to come up with an alternative solution. That was exactly what happened in those swamps, where I decided to do two things I hadn’t seen done before. One was using black-and-white instead of colour. It was tempting to shoot in colour, because the autumn colours are amazing. The other thing I did was to include people in the images, which is something most landscape photographers shy away from. By combining those two, I was able to create something that was very different from other photographs shot in those areas. * The Travel Photographer of the Year exhibition (tpoty.com) is at 10 Stockwell Street, the award-winning building at the University of Greenwich, within the Maritime Greenwich Unesco World Heritage Site, from July 22 until September 4, seven days a week; admission free. * For more of Marsel van Oosten’s work see squiver.com.